Even if you know how a sewing machine works, it’s still not enough to get the flawless proportions and the correct fit. But if you follow these steps you can make a competition bikini yourself! On average, you start cutting down eight weeks before the competition. By that time, you must choose the style, color, material, and measurements of your competition bikini suit, and then, finally you need to place an order. Why is it like this? It takes a minimum of three weeks to get a custom bikini suit made by individual measurements. Add in the delivery time and you get exactly the right amount of time needed to decorate it with crystals. You should work slow and very carefully to get a professional looking competition bikini. If you work with the decoration for about two hours every day, in five days you will have a finished bikini. Of course, a professional looking final product depends on the amount of crystals, their size, the intricacy of the design, and your skills. 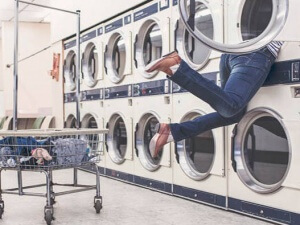 From our own experience, we understand that this process is long and that you’ll want to work harder to get faster results, however, you must manage your time between working out and decorating your bikini. That’s why you must ask yourself – are you ready to make your own bikini? If the answer is yes, then let’s continue! Before making the order, talk with your coach and check the federation’s website for the requirements to the stage competition bikinis. Attention is paid to the bikini bottoms, because they cannot be too low cut or too short. If the bottoms are too short then you may be disqualified, however, the bikini tops are not as heavily scrutinized. A lot of companies offer the competitors tops with a triangle cup and no padding. To our clients, we recommend you rationally estimate your measures because this bra model doesn’t suit a smaller size bust, especially after your peak weak. You can fix the situation with a “push-up” bikini top. A little tip – order extra padding; built-in padding and you will look perfect from the stage. Crystals divide into types by their fastening to the bikini’s material: Hot-Fix Crystals and Non-Hot Fix Crystals. Hot-Fix crystals are more expensive because of the glue in its base, and they also demand a special copper-bit for fastening. For work at home the first variant would be much more comfortable. However, if you mistakenly bought the Hot-Fix crystals, don’t panic! You can always attach them with the cold method. That is why we are going to tell you about Non-Hot Fix crystal work. Choosing the color of the crystals look at the color of the cloth, think of your wishes and fantasies. 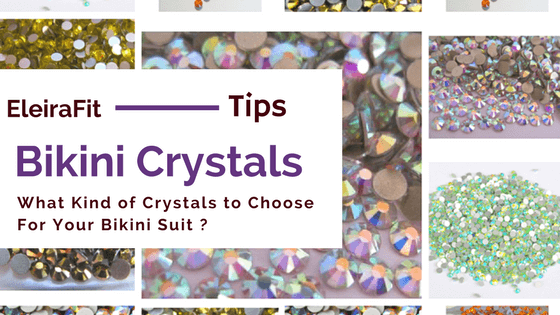 If you want self-colored bikini – choose the crystals to match the tone of your skin. The Crystals have color names, for example Light Siam, and its type – with the shine or without (Light Siam AB). Don’t be worry if the shade of the bikini and the shade of the crystals don’t match – that doesn’t matter. The materials from which the bikinis are made could have many different undertones; that never happens to the crystals. However, crystals adapt to the base color through faces and light refraction. It’s also up to you to decide if you want to mix different colors, tones, kinds, and sizes of crystals. Now – about the crystals’ size. The classic and most convenient sizes are 16 and 20. Crystals size 16 shine more because of the amount of faces it has. Your bikini will literally shine from the stage. But remember – decorating with these crystals will take more time because of their small size. The benefit of working with the crystals size 20 is convenience, since they are bigger, the decorating goes quicker. 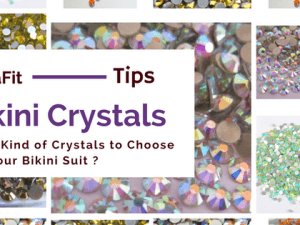 We are often asked: how many crystals are needed for a bikini? Let’s say it depends on many factors. First, everything depends on the size of a bra: the bigger the size – the bigger the space you have to decorate. Second, it depends on the amount of time and money. On average, to fully cover a C-sized cup and the bottom with rhinestones you need about 3000-3500 size 16 crystals. You can always orient yourself looking at our models because we indicate the number of crystals. Crystals are sold by shops with the amount of crystals in the pack on the wrapper. The standard fabric pack consists of 1440 pieces. It’s not profitable to order smaller number of crystals. he crystal. This is not very comfortable and does not look very neat. The glue that we prefer doesn’t have such an effect on the bikini. The fact that it is white while wet is not a problem because after it completely dries it turns clear. If a small white circle of glue around the crystal was left – this is normal. It won’t be visible when the glue dries out. More important not to allow the glue sticking on the faces of the crystal to avoid the loss of shine. It is possible that the white effect may come out in after washing but it is temporary. Wait for the bikini to dry and you will see that everything has come out alright. Don’t forget that the glue that it is toxic and that you should wear a mask while working with it. Make sure you don’t allow the glue to touch your skin and work in a well aerated place. It’s better to not choose very complicated patterns for the first time designing a bikini. Don’t work too hard! Leave some energy for the good workouts! It takes about half an hour for the glue to completely stick to the material. If the crystal is not on the right place you can fix it by carefully taking the crystal away and wiping the glue from the material. The best thing for this is a cotton bud or a napkin. The most important thing is to keep the neighbor crystals at their places. A toothpick can help you to remove extra glue in a process of placing a crystal. If you put your personal time and creative energy into your bikini, then you want to stay happy with it even after your competition. Therefore, you need to take care of it. Here are some pieces of advice that we collected in our article. Don’t worry if some of the crystals fall off from washing or wearing it. This happens to the places where there is not enough glue on a crystal or in folding area. Just as a rule, have a few extra crystals and after the bikini is completely dried, change the crystals with the new ones. In the end… We are happy if our advice helps you to create a masterpiece with your hands. There is nothing wrong with decorating your own bikini. Many famous athletes also started out doing this. But if you decided to concentrate on your body, you can always trust us on the bikini. Save these instructions for later! Enter your email address!